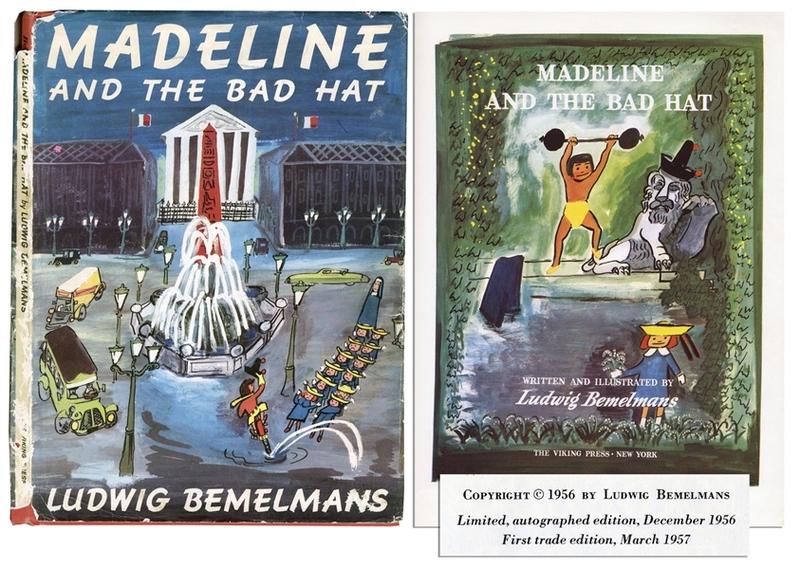 First edition of ''Madeline and the Bad Hat'' written and illustrated by Ludwig Bemelmans. The Viking Press: New York: 1957. The original dust jacket bears the price of $3.50. The classic 54pp. children's story is set in Paris and depicted vibrantly by Bemelmans' artwork. Bound in red cloth boards with colorful illustrated endpapers. Measures 9'' x 12.25''. Bumping to board corners and light soiling to leaves. Near fine. Chipping to dust jacket folds and spine, and paper loss to backstrip, else very good.